In 2017, Dr. Peter Capizzi took a closer look at incorporating renewable energy at his cosmetic surgery practice. Future increases in utility costs were a concern, but could solar lock in affordable energy? With the cost of solar having come down in recent years, he moved ahead with a solar energy consultation to find out if it would be a good fit. The practice soon learned that their building had a suitable roof for solar and that it could provide financial and environmental returns. 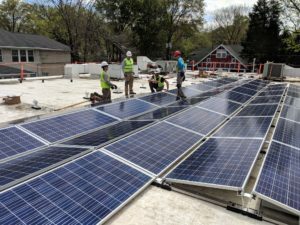 Not only would the practice become more competitive by saving on monthly fixed costs, without sacrificing quality of care to clients, but going solar also enabled the practice to use tax credits and other business tax strategies to accelerate the financial benefit of going solar – a federal tax credit would essentially pay for 30% of the project cost to the customer. Dr. Capizzi, MD is demonstrating environment consciousness through solar. Within the first year using solar power, the practice will avoid over 65,000 pounds of carbon dioxide emissions. In its first 30 years of operation, the solar system will save $0.25 million in electric utility costs and will attract and impress new clients.